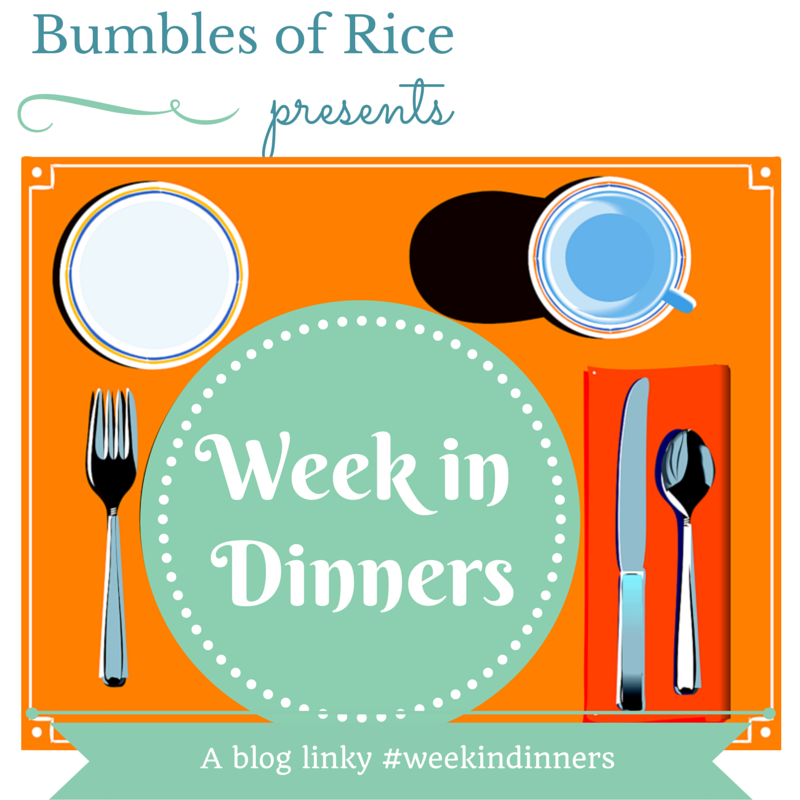 I'm joining in with Sinéad from Bumble's of Rice's 'A Week in Dinners' linky today. I've been keeping note of and trying to remember to take pictures of our dinners this past week. The idea of this linky is to get a glimpse of what real families really eat and not just what they share on Instagram. As we're still in January and still getting over the indulgences of Christmas I'm trying to detox a little bit and to shake off the pounds gained over the festive season. I've been trying to follow the advice I was given by a nutritionist years ago to eat my main meal in the middle of the day rather than in the evening, so my dinners have mostly been soup, soup and more soup. I keep my portion of the dinners cooked in the evening for the rest of the family and have them the next day at lunchtime. Devo and I share the cooking now that I am at home. While he was a SAHD, he was the main cook in the house and I'm only now starting to get to grips with meal planning and recipe collecting. I'm hoping this linky will give me lots of inspiration as I have very little in my repertoire at the moment! Me: Fresh Tomato and Basil Soup from Lidl. This is very loosely based on a very simple Nigella recipe. I make it with a half bag of whatever prawns are in the freezer and whatever veg we have knocking around in the fridge. I don't usually add the chili or the bok-choi from the original recipe as I don't often buy either. We only had one green pepper so I added a few thinly sliced carrots to the recipe. I also served it with rice instead of noodles which I stirred through the veg/prawn mix at the end. Sábha: "Not bad, but very yummy"
There were clean plates all round. Me & The Girls: Carrot, Parsnip and Red Lentil Soup. I made this myself but I didn't follow a recipe (I rarely do for soup) just bunged the veg (including an onion and some garlic) and lentils into a pot with some stock, simmered it until the veg were tender and then blitzed it with a stick-blender. We spent the afternoon at the seafront and after walking a couple of miles and playing in the playground the girls were frozen (there was snow in most of the country that day!) so I treated them to takeaway chips and chicken nuggets to warm them up and to keep them going on the long walk back to the car. Also, just before dinnertime it started to snow and Lile and Sábha went out to play in it - in the dark.This chunky soup was the perfect antidote to both the cold hands and the unhealthy lunch. Lile: "Very delicious" She ate it all up with two slices of wholegrain bread. Sábha: "I'm just a bit tired and I'm still full from the chips and I don't like carrots today" She ate a few spoonfuls and ate a slice and a half of wholegrain bread dipped in the soup but, unusually for her, didn't finish her dinner. Family: Devo made Daal and rice. The basic recipe is from the back of a yellow lentil pack but Devo makes it differently every time, only keeping the spice measurements the same. He used red lentils this time and added spinach and some quorn chicken pieces. This is one of the girls' favourite dinners (yes I am VERY smug about my children eating lentils, but I assure you, it's pure fluke), so every scrap was devoured. Thursday was a slow day. Our car battery died in the cold snap and there was high winds and intermittent rain all day, courtesy of Storm Rachel. We decided to have a pyjama day and ignore the outside world. There was a lot of tea drinking done, a massive accumulation of toys in the sitting room by the end of the day and we did very, very little. Me: That bloody soup again. Family: Pasta and Pesto Rosso with a sprinkle of parmesan. Simple and tasty. Clean plates again! Friday dinners are always a bit hit and miss. I bring the girls to visit my grandmother every Friday afternoon and, as my mother, my aunt, and several cousins also gather there, there is always a bit of a party vibe. There is always a cake and always a few treats set aside for the smaller visitors.We learned long ago that it's not worth cooking anything fancy on Friday nights because it always ends in a battle trying to get them to eat and frustrated parents when they don't. Sometimes all they have room for is a boiled egg and toast or even just 'bits and bobs' which is basically a deconstructed salad. That day, much to their delight, they got to share a frozen margherita pizza. Devo and I treated ourselves to a takeaway from a new local spot called Street Food Outlet. I had the Torn Chicken Burrito 'naked' (which means no tortilla wrap) and some sweet potato fries. It was delicious. So that's five of our dinners! I'm not sure how inspirational any of it is, but I guess it is 'real' - which is the whole purpose of this exercise. For more dinner inspiration and to see how other real families eat please do click on the 'Week in Dinners' image above or HERE to read the other entries in this linky. Also, because I'm trying to get a handle on this whole meal planning thing, I decided to design a little meal-planning printable plus a shopping list (Click HERE to have a look/download). Then, when I did a quick search of meal planner templates, I found THIS - which has all of the styles you could ever need and then some. Happy Planning! Your kids are great eaters and you are a great no-recipe soup maker and food photographer - now I'm off to look at the printable!